My client for this cake had already ordered a 1st birthday cake for her daughter and decided that she also wanted to have one made for her father-in-law who was turning 70 on the same weekend. After talking to her, I learned that her father-in-law’s two favorite things were fishing and tending to his cows. She also told me that he preferred simple rather than elaborate. Based on this information, I created this cow cake. I usually prefer to stay away from a simple round cake, but I think for this case it was appropriate as a 70 year old man usually is not looking or a grand tiered cake. I also chose to use just buttercream as opposed to fondant to, again, give it a polished but more simple look. 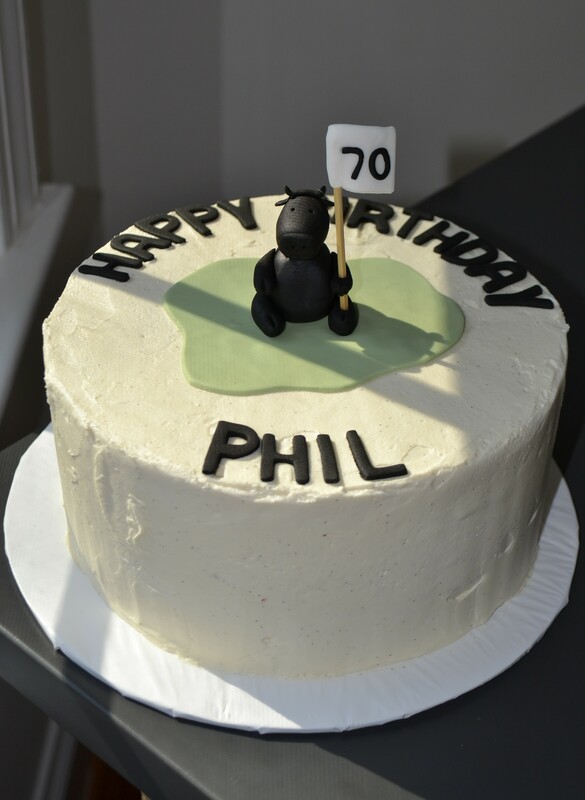 I topped it off with a fondant cow (which is black because, as my client so graciously educated me, her father-in-law raised beef cows which are black and not milk cows which are black and white)! holding the “70” sign and a simple message.